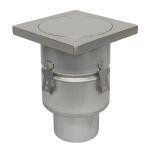 BFD-610 AISI Type 304 stainless steel industrial floor drain with 8in. x 8in. square solid gastight cover for vacuum handle removal, and bottom outlet. BLÜCHER Channels and Drains: Compliance with NSF/ANSI/3-A 14159-1-Hygiene Requirements for the Design of Meat and Poultry Processing Equipment. Disclaimer: BLÜCHER product dimensions in U.S. customary units and metric are approximate and are provided for reference only. For precise measurements, please contact BLÜCHER Technical Service. BLÜCHER reserves the right to change or modify product design, construction, specifications,or materials without prior notice and without incurring any obligation to make such changes and modifications on BLÜCHER products previously or subsequently sold. Please Note: BLÜCHER literature requires Adobe Acrobat Reader to view.